Yashikha.com - One of the Leading Companies for Emerging Technologies Training,workshops and corporate trainings. This course is part of the NMIMS Global Access School For Continuing Education along with Yashikha brings to you this amazing learning opportunity. 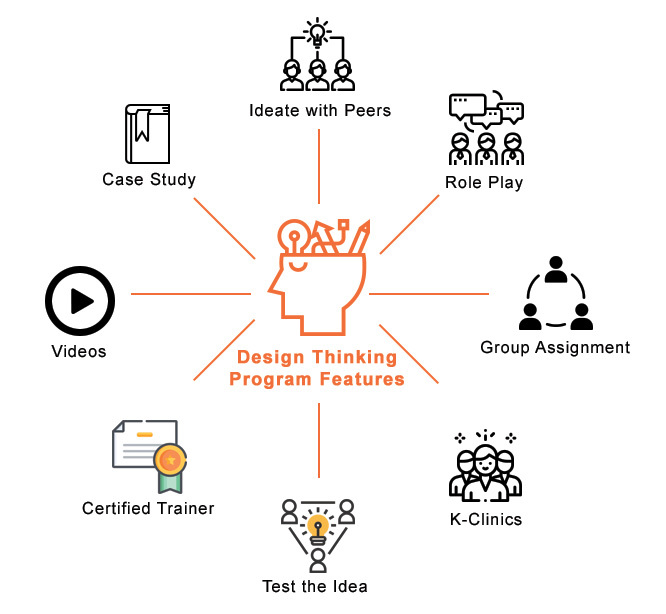 Module 1 : What is Design Thinking? The Faculties are expert Design Thinker, Digital Transformation Leads, User Experience Strategists, Management Consulting Professionals and Stanford Graduate School of Business Alumni’s. Venue: NMIMS Campus, Tarnaka Region, Hyderabad. ANY REFERENCE TO A NATURAL PERSON WILL, UNLESS REPUGNANT TO THE CONTEXT, INCLUDE HIS HEIRS, EXECUTORS AND PERMITTED ASSIGNEES. SIMILARLY, ANY REFERENCE TO A JURISTIC PERSON SUCH AS YASHIKHA WILL, UNLESS REPUGNANT TO THE CONTEXT, INCLUDE ITS AFFILIATES, SUCCESSORS AND PERMITTED ASSIGNEES. YASHIKHA RESERVES THE RIGHT TO REFUSE ACCESS TO USE THE SERVICES OFFERED IF IT IS BROUGHT TO YASHIKHA'S NOTICE OR IF IT IS DISCOVERED THAT YOU ARE UNDER THE AGE OF 18 YEARS. REGISTERED USERS: YASHIKHA MAKES CERTAIN SECTIONS OF THE SERVICES AVAILABLE TO YOU THROUGH THE WEBSITE ONLY IF YOU HAVE PROVIDED YASHIKHA CERTAIN REQUIRED USER INFORMATION AND CREATED AN ACCOUNT AND A YASHIKHA ID THROUGH CERTAIN LOG-IN ID AND PASSWORD ("ACCOUNT"). IN THE EVENT YOU REGISTER AS A USER BY CREATING AN ACCOUNT IN ORDER TO AVAIL OF THE SERVICES PROVIDED BY THE WEBSITE, YOU WILL BE RESPONSIBLE FOR MAINTAINING THE CONFIDENTIALITY AND SECURITY OF THE ACCOUNT, AND ARE FULLY RESPONSIBLE FOR ALL ACTIVITIES THAT OCCUR UNDER YOUR ACCOUNT. YOU AGREE TO (A) IMMEDIATELY NOTIFY YASHIKHA OF ANY UNAUTHORIZED USE OF YOUR ACCOUNT INFORMATION OR ANY OTHER BREACH OF SECURITY, AND (B) ENSURE THAT YOU EXIT FROM YOUR ACCOUNT AT THE END OF EACH SESSION. YASHIKHA CANNOT AND WILL NOT BE LIABLE FOR ANY LOSS OR DAMAGE ARISING FROM YOUR FAILURE TO COMPLY WITH THIS SECTION. YOU MAY BE HELD LIABLE FOR LOSSES INCURRED BY YASHIKHA OR ANY OTHER USER OF OR VISITOR TO THE WEBSITE DUE TO AUTHORIZED OR UNAUTHORIZED USE OF YOUR ACCOUNT AS A RESULT OF YOUR FAILURE IN KEEPING YOUR ACCOUNT INFORMATION SECURE AND CONFIDENTIAL. YOU SHALL ENSURE THAT THE ACCOUNT INFORMATION PROVIDED BY YOU IN THE WEBSITE'S REGISTRATION FORM IS COMPLETE, ACCURATE AND UP-TO-DATE. USE OF ANOTHER USER'S ACCOUNT INFORMATION FOR AVAILING THE SERVICES IS EXPRESSLY PROHIBITED. IF YOU PROVIDE ANY INFORMATION THAT IS UNTRUE, INACCURATE, NOT CURRENT OR INCOMPLETE (OR BECOMES UNTRUE, INACCURATE, NOT CURRENT OR INCOMPLETE), OR YASHIKHA HAS REASONABLE GROUNDS TO SUSPECT THAT SUCH INFORMATION IS UNTRUE, INACCURATE, NOT CURRENT OR INCOMPLETE, YASHIKHA HAS THE RIGHT TO SUSPEND OR TERMINATE YOUR ACCOUNT AND REFUSE ANY AND ALL CURRENT OR FUTURE USE OF THE WEBSITE / SERVICES (OR ANY PORTION THEREOF). GUEST USERS: THE WEBSITE ALSO ALLOWS LIMITED ACCESS TO THE SERVICES FOR UNREGISTERED USERS (ALSO CALLED AS 'GUEST USERS'). SUCH USERS WILL BE ABLE TO BROWSE THE WEBSITE. YASHIKHA IS AN ONLINE PLATFORM INTER-ALIA ENGAGED IN THE BUSINESS OF PROVIDING SKILL BASED TRAINING SERVICES, PLACEMENT SERVICES AND OTHER SIMILAR SERVICES THROUGH ITS WEBSITE. NEITHER YASHIKHA OWN, SELL, RESELL, FURNISH, PROVIDE, PREPARE ANY PRODUCT NOR MANAGE AND/OR CONTROL THE USERS. YASHIKHA RESERVES THE RIGHT TO OFFER THE DISCOUNTS/PROMOTIONAL OFFERS TO ANY USERS OF ITS OWN CHOICE AND SHALL NOT BE HELD LIABLE TO ANY USER FOR NOT OFFERING THE SAME. THE DISCOUNTS/OFFERS HAVE BEEN MADE AVAILABLE AT THE SOLE DISCRETION OF YASHIKHA AND ARE SUBJECT TO CHANGE / AMENDMENT / MODIFICATION FROM TIME TO TIME. YASHIKHA AT ITS SOLE DISCRETION MAY AT ANY TIME DISCONTINUE THE DISCOUNTS/OFFERS WITHOUT ASSIGNING ANY REASONS OR WITHOUT ANY PRIOR INTIMATION WHATSOEVER. THE PARTICIPATION IN DISCOUNTS/OFFERS IS ENTIRELY VOLUNTARY AND IT IS UNDERSTOOD, THAT THE PARTICIPATION BY THE USER SHALL BE DEEMED TO HAVE BEEN MADE ON A VOLUNTARY BASIS. YaShikha Skill Development Private Limited (“YaShikha” or “We” or “Us” or “Our") is concerned about the privacy of the data and information of users (“You” or “Your” or “Yourself”) accessing the services on YaShikha’s websites, mobile sites or mobile applications ("Website"). 1.1. The Information (which shall also include data) provided by You to YaShikha or collected from You by YaShikha may consist of "Personal Information" and "Non-Personal Information". 1.3. Such Personal Information may be collected in various ways including during the course of You registering as a user on the Website, registering as a merchant on the Website, availing certain services offered on the Website. Such instances include but are not limited to participating in any online survey or contest or otherwise or posting user reviews or otherwise doing business on the Website. 1.5. YaShikha may also collect information other than Personal Information from You through the Website when You visit and / or use the Website. Such information may be stored in server logs. This Non-Personal Information may include Your geographic location, details of Your telecom service provider or internet service provider, the type of browser (Internet Explorer, Firefox, Opera, Google Chrome etc. ), the operating system of Your system, device and the Website You last visited before visiting the Website or the duration of Your stay on the Website is also stored in the session along with the date and time of Your access. 1.8. You hereby represent to YaShikha that:- a) the Information You provide from time to time is and shall be authentic, correct, current and updated and You have all the rights, permissions and consents as may be required to provide such Information to YaShikha. b) Your providing the Information to YaShikha and YaShikha's consequent storage, collection, usage, transfer, access or processing of the same shall not be in violation of any third party agreement, laws, charter documents, judgments, orders and decrees. 2.8. if You avail of any service from the Website, to complete and fulfil the same. 2.20. to enable a potential buyer or investor to evaluate the business of YaShikha. [Individually and collectively referred to as ("Purposes")] You hereby agree and acknowledge that the Information so collected is for lawful purpose connected with a function or activity of YaShikha or any person on its behalf, and the collection of Information is necessary for the Purposes. 3.1 The Services are not available to You hereby unconditionally agree and permit that YaShikha may transfer, share, disclose or part with all or any of Your Information, within and outside of the Republic of India to third party service providers / partners / banks and financial institutions for one or more of the Purposes or as may be required by applicable law. 5.2. We reserve the right to conduct a security review at any time to verify Your identity. You agree to provide Us all the information that We request for the security review. If You fail to comply with any security request, We reserve the right terminate Your account with Us and prohibit Your access to the Website. 5.5. Notwithstanding anything contained in this Policy or elsewhere, We shall not be held responsible for any loss, damage or misuse of Your Personal Information, if such loss, damage or misuse is attributable to a Force Majeure Event (as defined below). A "Force Majeure Event" shall mean any event that is beyond Our reasonable control and shall include, without limitation, sabotage, fire, flood, explosion, acts of God, civil commotion, strikes or industrial action of any kind, riots, insurrection, war, acts of government, computer hacking, unauthorised access to computer data and storage device, computer crashes, breach of security and encryption, etc. You agree and acknowledge that You are providing your Information out of your free will. You have an option not to provide or permit YaShikha to collect Your Personal Information or later on withdraw Your consent with respect to such Personal Information so provided herein by sending an email to the grievance officer or such other electronic address as may be notified to You.